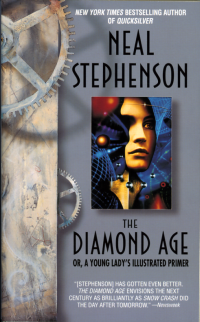 If one word could describe The Diamond Age, or A Young Lady’s Illustrated Primer, it would be “surreal.” I think that this is one of the main reasons that it won the Hugo Award in 1996. The main setting for this novel by Neal Stephenson is in the middle 21st century Shangai, shifting briefly to other places such as Vancouver and London later on. Nanotechnology is heavily used at this time, especially in Matter Compilers, usually referred to as an M.C. Matter flows from the “Feed”, which comes from the “Source” of the raw materials used to create everything from food to household items. A Source is much like a power station, except that it transmits matter rather than energy. This technology greatly affects the economy, because there is no need to harvest simple things like rice when they can be created by the M.C. Stephenson manages to integrate nanotechnology into every day life in a matter-of-fact sort of way, explaining the various functions of these tiny machines in plain English. Rather than having specific countries as we do today, the world in The Diamond Age (of which diamonds are used for windows because they can be easily created with the M.C.) is split up into various phyles, or societal groups. A member of a phyle is refered to as a thete. The three greatest, or first-tier, phyles are New Atlantis, Nippon, and Han. There are many lesser phyles ranging from Mormons, Jews, Armenians, Navajos, Senderos, etc. The most successful phyles fashion themselves to be Victorian, incorporating that style into their lives. In a world full of electronic communication the richest men prefer to paper newspapers, which is generally unheard of. The lesser phyles, such as the Celestial Kingdom and the Coastal Republic resent the greater phyles such as New Atlantis. This friction serves as one of the main plot lines in this novel. One of the main characters is John Percival Hackworth, which is an engineer for nanotechnology. He has just finished with as a team leader in an immense project for Lord Finkle-McGraw who is at the top echelon of the elite as an Equity Lord in New Atlantis. Hackworth is given the task of creating a device for Lord Finkle-McGraw’s granddaughter, which is A Young Lady’s Illustrated Primer. This device is essentially an interactive book which is meant to teach and guide a young girl. Hackworth decides that his daughter should also have a copy of this device, which creating would be a serious crime. He manages to smuggle the plans out of his work and bring them to Dr. X., which has a special black market Source and matter compilers which can create another copy for his daughter. All things go well until Hackworth gets mugged on his way back to his house. The “Primer” (as I will refer to it from here on) is carted away by a young boy named Harv which gives it to his sister Nell. The Primer is not simply an interactive book; it teaches Nell a variety of skills from polite manners to martial arts (yes, martial arts). The programming incorporates real world events and integrates them into an ongoing story, of which involves “Princess Nell.” She goes on adventures with her various friends which are simply stuffed animals in the real world. The Primer speaks to Nell through a “ractor”, or interactive actor, rather than using a computer generated voice. The character Miranda landed the role as voice actor for Nell’s Primer and simply reads a prompt which is generated by the Primer. Many of the lessons are not simply viewed by Nell, but are “ractives”, I’m assuming short for interactives. In these scenarios Nell is able to control the scene or lesson, trying again and again until she gets the correct result. From here on out the novel gets exponentially more complex. It weaves through the main plotlines of Nell, Hackworth, Miranda. The main focus, however, is on Nell and her development from a 4 year old girl into a young woman. Each chapter is preceded by a unique one to two sentence summary of what is about to happen. I haven’t seen such summaries before, but according to Wikipedia this seems to emulate the style of Charles Dickens. Part of the reason I liked this book was Neal Stephenson’s quirky humor. Kentucky Fried Chicken is considered to be a fancy place to eat, and is referred to as “The House of the Venerable and Inscrutable Colonel” when referred to in Chinese. This reminds me a bit of how pizza delivery is a booming business controlled by the mafia in Snow Crash. There are countless humorous insights to society and life in general interspersed throughout The Diamond Age. I really enjoyed this book, but the ending left me with a somewhat empty feeling. I think that anyone that reads this book would expect at least one more chapter to tie up some loose ends.